Alex on the slopes at Northstar at Tahoe in 2007. We can’t really say that skiing is a family hobby, although Marie-Hélène’s and my first date was a ski weekend in Megève in early 1994. That weekend could have been the start of something great. If I could ski, that is! Unfortunately, I can’t, which may have something to do with skiing not really having become a family hobby. I didn’t exactly want to admit that I couldn’t ski in advance of our first weekend, because finding something that Marie-Hélène actually wanted to do with me had been extremely difficult. We’re not going to speculate as to why! 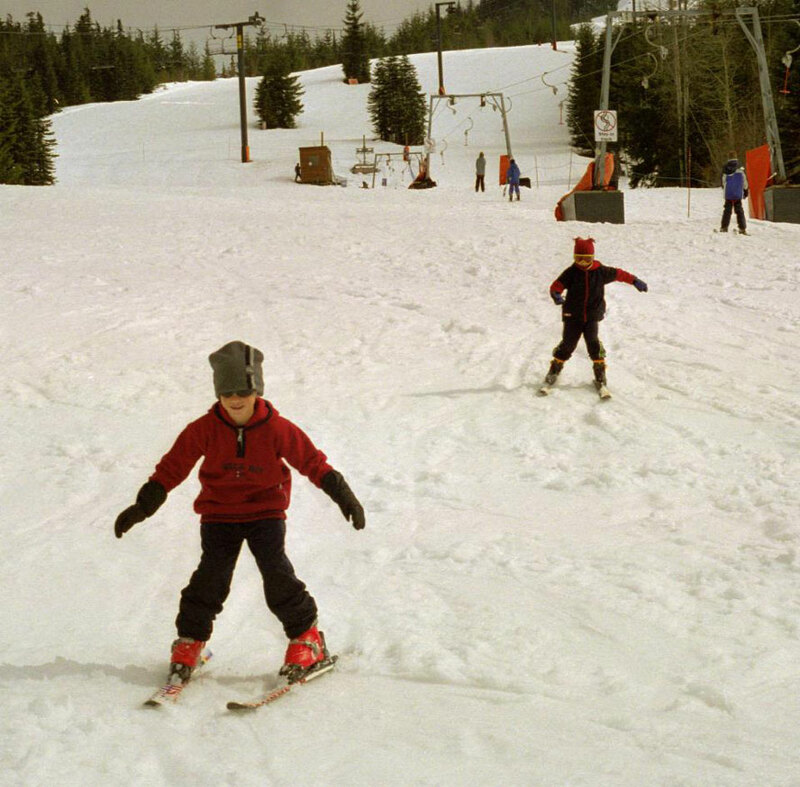 Charlie and Alex on the extraordinary slopes at Whistler in British Columbia, 2003. She loved to ski, that much I knew, and when I proposed a ski weekend in March 1994, she finally accepted my invitation. I wouldn’t like to count how many of my invitations she’d charmingly ignored or deftly turned away, but we’re dealing with big numbers here, over a long period. The funny part of this weekend occurred at the top of the ski lift in Megève, the first and only time I went up it. It was beautiful up there, looking down on a bright sunny day onto such a scenic resort and across the snow-covered Alps. I spent a long time looking at this wonderful view, all the time discretely trying to pluck up the courage to point myself downhill. 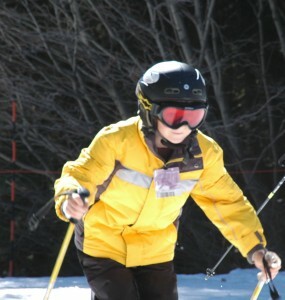 When you’re not a skilled skier, the force of gravity seems to accelerate you very quickly, even on a gentle slope. It took a while for Marie-Hélène to figure out that I was pretty much paralyzed. You’re not expecting to see me on skis, I hope! This is as close as I get! 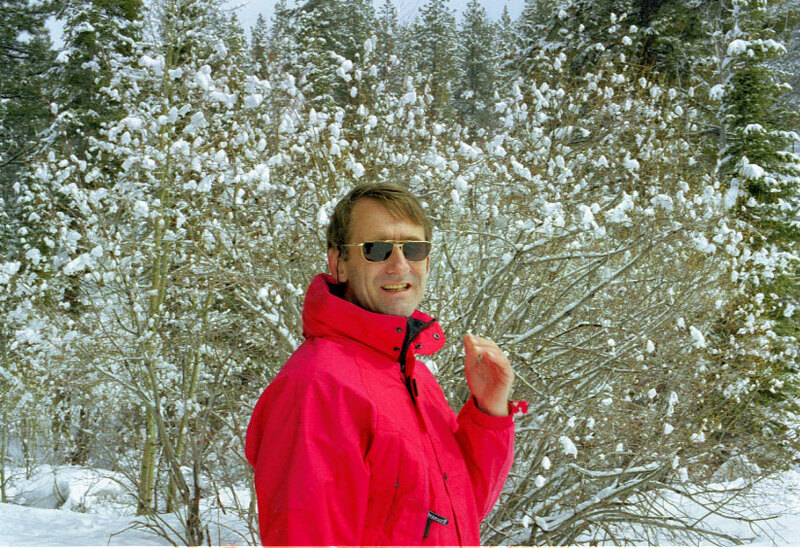 Near Truckee in 1998. When she did, of course, I was obliged to un-paralyze my legs, which shook like jelly as soon as I stood on them, something to with those slippery skis between my feet and the slippery snow and ice. Off we went, with her darting backwards and forwards, around me, behind me, in front of me, effortlessly skilled and trying to help me on my way down. I concentrated on braking. It had been 26 years since my first and last ski vacation, which ended with a cracked tibia, mine, after some poor braking. I didn’t want to repeat. Most of the time she was too kind to laugh, but not all the time! Maman does ski, effortlessly from the point of view of those of us who don’t. 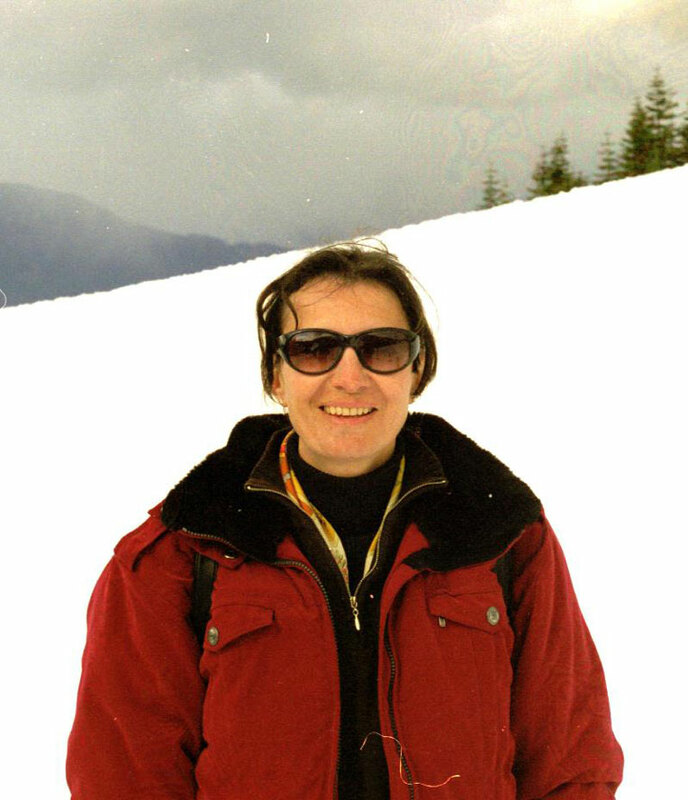 On the slopes at Whistler in 2003. Jump to 2002. We’re all living in California, and made our first ski trip all together. 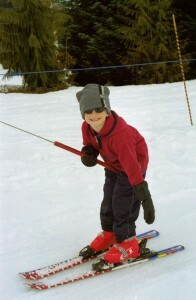 We’d made a short trip to Truckee for the snow in 1998, but had contented ourselves with sledding that year. 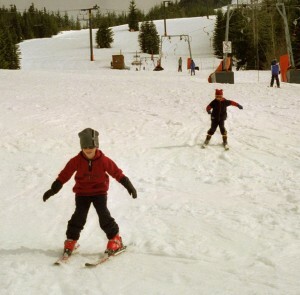 Charlie and Alex weren’t ready for skis (Alex was three months old!). We went to Alpine Meadows in 2002, and everyone had a great time. Charlie and Alex, for whom this was their first time on skis, loved it as much as the rest of us. Here‘s one of those rare photos of the eight of us, taken at Alpine Meadows during that trip. Now, if only Alpine Meadows would offer a family plan for BIG families for their lift tickets and equipment rental packages!! It’s the same problem that we had at Disneyland. Going up is as much of a challenge as coming down: Alex mastering the technique at Whistler. My first memory of that trip is more of the same. I didn’t even rent skis, but walking on the ice still somehow managed to fall over backwards, and land hard on the camera backpack, hurting my back. See? Skiing and I have an adverse relationship. Then there was Tom! Obviously, he couldn’t yet ski. None of the children could. 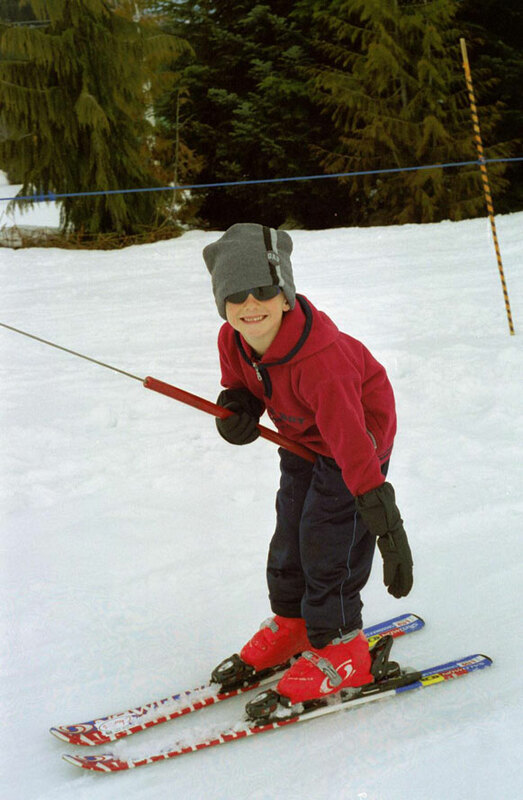 He’d maybe gone on a ski trip with his French school at some point while he was living with his mom in Paris, but that was the extent of his downhill experience. That minor detail had zero impact on his skiing that day. He came barreling down the slopes, laughing his head off, as far as I could tell almost completely out of control, and loving every minute of it! I was afraid for the grown men in his path, not to speak of the children! He was fine, of course. I was the one who had hurt his back! Charlie on the towbar, also at Whistler. Six of us then went skiing during our Vancouver vacation in early spring 2003, at Whistler, the resort north of Vancouver with a vast skiable area even in May or June. Where were Nick and Tom? Don’t remember. For that matter, where were Daphné and Alban on the slopes? That I do remember. They looked after the little guys on the beginners’ slopes until the parents arrived, and then disappeared for the rest of the day, on to more challenging things. So we got no pictures of either on the slopes at Whistler. But somehow they were learning to ski. And in the case of Daphné, learning to love skiing the same way that her mother does. She and her then beau skied Heavenly about one weekend in two during the 2006-7 season, driving there and back each time to do so. She continued her independent ski trips, and then moved to South Lake Tahoe for the entire ski season in 2009. Now she was about as happy as a ski bum could be! 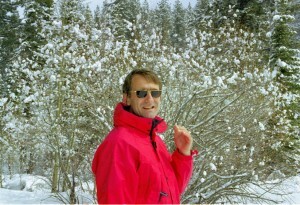 Our first family trip to the snow was to Truckee in April 1998, accompanied by Edgar. Here’s Alban on his sled. We made our last family ski trip in 2007. Five of us made it, the parents, and Alban, Charlie and Alex. This trip was to another of the Tahoe resorts, Northstar. We’d bought a weekend in a condo there during a Breakers fundraising auction (the Breakers is the local competitive youth soccer club), and the five of us finally (weekends away always involve significant coordination) made it out there on one of the last skiable weekends of the season. This was good timing! The snow was still plentiful, but it was warm all day. We got some great pictures during that trip! This was serious fun, for both of them. Even for the spectators: it was over 60F that day in Tahoe! They enjoyed the skiing the same day, but this makeshift sledding clearly took the cake!